I am trying to connect a flow meter YF-S201 to Raspberry Pi B+. Someone has used this flow meter ¿How should I connect it? As long as your flow meter has an open collector output (as most seem to) it should be quite safe to use with the Pi. An open collector output means that the pulse is indicated by the sensor pulling the output pin to ground (0). At other times the sensor lets the output pin float to an external voltage. This means you need a pull-up to 3V3 through a resistor on the sensor output pin. A resistor value of 4k7 is quite normal. 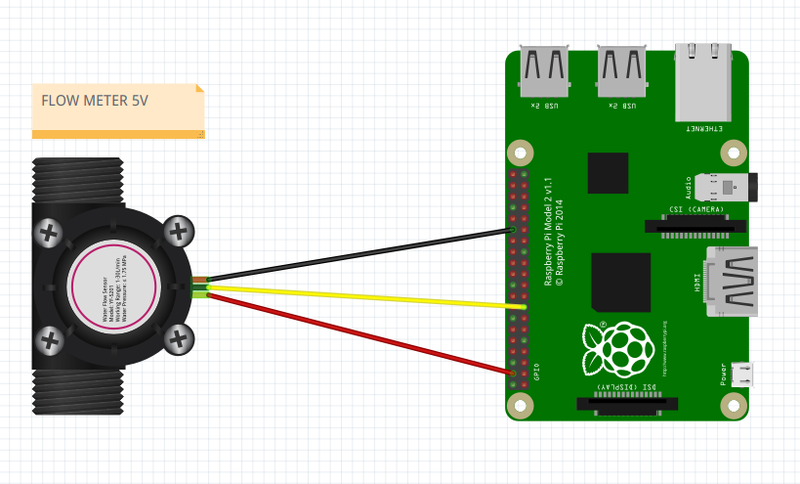 Alternatively you could just enable the internal GPIO pull-up to 3V3 for the GPIO you connect to the sensor's output pin. Searching the Internet I found this circuit for a flow meter. I don't know very much about electronics. How about it? Not the answer you're looking for? Browse other questions tagged python rpi.gpio pi-b+ or ask your own question. How to use the water flow sensor with raspberry?